It wasn't easy for Varun to reach this stage after all the rejections in the early stages of his career. Varun Chakravarthy has been one of the most inspirational stories one would ever come across. 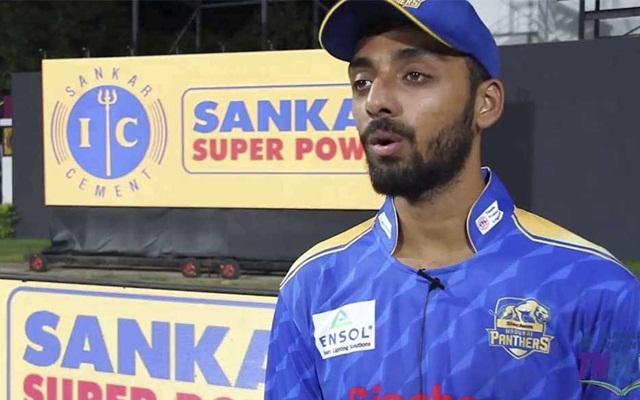 This Tamil Nadu cricketer put the IPL Auction 2019 on fire with as many as five out of the eight teams were involved in an intense bidding war for him. Varun isn’t one of those cricketers who has gradually risen up the ranks. This mystery spinner believed in sheer hard work and his dedication towards the game is immense. He was sold at Rs 8.40 crores to the Kings XI Punjab in the auction. Delhi Capitals and Chennai Super Kings started off the bidding war for him. Then, Kings XI Punjab and Rajasthan joined in. Once Rajasthan decided not to go any further, KKR was into the action. His base price was multiplied by 42 times which is quite unbelievable. Varun Chakravarthy is currently 27 years old. He was born in Tamil Nadu on August 29, 1991. He hadn’t played much cricket until he was 13 years old. Varun played junior cricket for nearly four to five years till he was 17 years old. He was a wicket-keeper batsman initially. However, after several rejections in the age group, he decided to give up the sport to focus on his academics. After parting ways with cricket, Varun completely indulged himself in his academics. He pursued a Bachelor of Architecture degree at the SRM University in Chennai which is a 5-year course. Then he worked as a freelance architect and also joined a firm later on. While he was working, Varun also started playing tennis ball cricket. He learned numerous tricks with the ball while playing the tennis ball cricket and also took part in a few local tournaments. This helped him rediscover his lost love for the game of cricket. Having rediscovered his passion, Varun couldn’t keep himself away from the game for quite long. He quit his job in an architecture firm to pursue a career in cricket. He then joined CromBest Cricket Club as a seam-bowling all-rounder. But a knee injury that he sustained right in his second match sidelined him out of action and forced him to take up spin bowling. After returning from the injury, he signed a contract with Jubilee Cricket Club in the fourth division of the Chennai League. In 2017-18, Varun bagged 31 wickets in seven games at an average of 8.26 and economy rate of 3.06 in the one-day competition. Varun has got quite a few variations up his sleeve. He can bowl the off-break, leg-break, googly, carrom ball, flipper, top-spinner and a slider aimed at the toes of the batsmen to york them. Varun first attended the TNPL trails as a batsman. But looking at the immense competition, he decided to bowl the carrom ball just because he had to do something different. A video analyst called Hari was impressed, and he passed on the word to Robin Singh (Karaikudi Kaalai’s head coach). Then, the side decided to pick him. Chakravarthy picked up 9 wickets in 10 games in TNPL 2018. However, what stands out is his economy rate. He only gave away 4.70 runs per over which is one of his biggest strengths. His average of 20.88 is also decent enough. His economy rate was the best in TNPL 2018. This mystery spinner, a fourth-division cricketer until last year, has now played the Vijay Hazare Trophy and also made his Ranji Trophy debut. He bowled 86.4 overs in the VHT this year and picked up 22 wickets at an average of 17 and economy rate of 4.23. He was also the second-highest wicket-taker in the tournament. His best figures were 5/38 and soon was picked for Tamil Nadu for first-class cricket as well. Varun was the nets bowler to the CSK team while they were training in Chennai. He was quite happy to bowl to the superstars. However, his happiness was short-lived with the CSK matches being shifted to Pune previous season. “Net bowlers are usually from the first division or Ranji trophy level, and I was only a fourth division cricketer,” Varun says. “I just called Mr TS Mohan sir in TNCA and convinced him somehow to give me a chance. He was nice enough to consider me, and I ended up bowling to the CSK superstars. “But just when it was coming out well, Chennai’s matches were shifted to Pune. I was very sad. Suddenly, everything went blank again and for 15-20 days nothing happened,” he said. Later, AR Srikkanth, the video analyst of KKR helped him get an opportunity to bowl at their nets. Varun honed his skills with the guidance of Sunil Narine, Piyush Chawla, Kuldeep Yadav and Carl Crowe, Sunil Narine’s personal coach who also trained Kuldeep. “Suddenly AR Srikkanth, the video analyst of KKR called me through Dinesh Karthik. I stayed with the KKR team for 10 days,” he recalled.